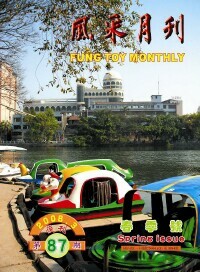 Welcome to the 15th issue of the Yee Fung Toy Global Village Voice, an electronic newsletter for the World Yee community. In this issue we are featuring celebrations of the annual Spring Banquets from associations around the world. 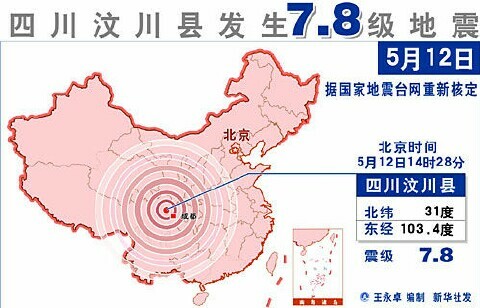 The 7.8-magnitude earthquake, which devastated the south-western province of Szechuan on May 12 has left more than 69,000 dead, 370,000 injured, with 17,406 listed as missing and more than 4.8 million people left homeless. The world communities responded, reaching out with their helping hands, providing clean drinking water and sanitation services, distributing relief supplies including food, shelter materials, and medicare, donating money to help these quake victims to rebuild their lives and lost homes. 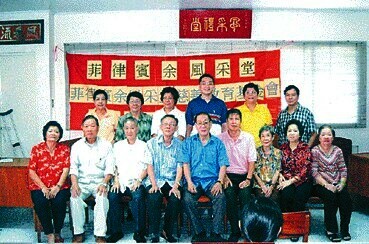 Members of the World Yee Family Association, The Yee Fung Toy Family Associations, the Yee Fung Toy Societies and The Hong Kong Yue Clansman, The students and teachers of the Fengcai Middle School, the students and teachers of Elegantia College also cared, contributing money to the various charitable organizations, which in turn forwarded the donations to the proper authorities in China to help those in need. 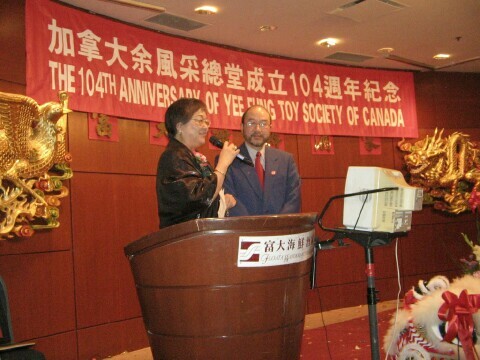 The Yee Fung Toy Society of Canada celebrated its 104th anniversary and the Chinese New Year of the Rat on February 23, 2008. The ancestor ritual Ceremony at noon. 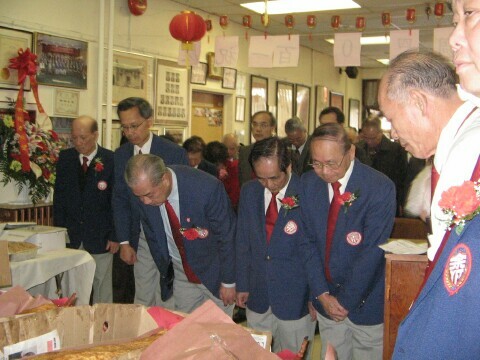 The ancestor ritual started at 12:00 noon in the YFT House on 226 East Georgia Street, Vancouver, B.C. 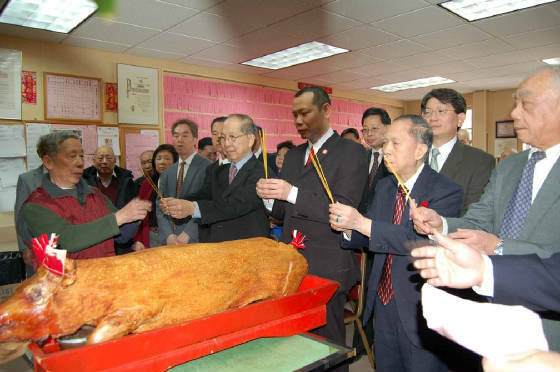 where Chairman Mr. Kan Yu, the YFT advisors, and the Board of directors made offerings to our ancestor Yee Chung-sheung. Mr. Steven Yee emceed the afternoon ceremony. Special guests who attended this ceremony include B.C. 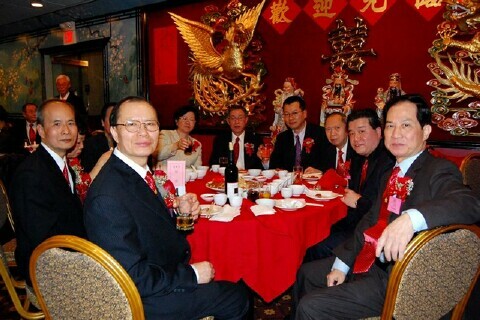 MLA Mr. Richard T. Lee; YFT Society of Montreal Advisor Mr. and Mrs. Wing Shui and our cousins from the Mah Society and the Tse Clansman Association. After the ritual our YFT women's Choir sang the YFT Society Song, Mr. Gary Yee delivered a welcoming speech that touched on the history of the Society. Congratulatory speeches from our guests. Followed by Mr. Shui Ji Yu who read the congratulatory letters, then Mr. James Yu gave the thank you speech. 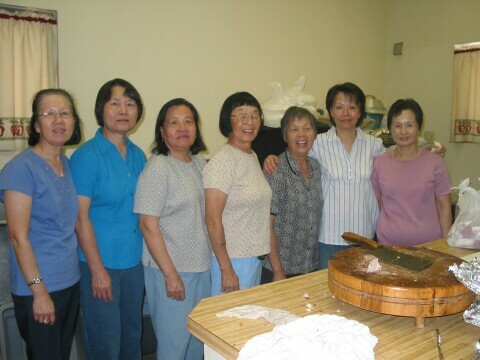 After the short ceremony, we all had lunch in the YFT House, we especially enjoyed the delicious home made traditional dim sum provided by members of the Tse Benevolent Association Women’s Committee. 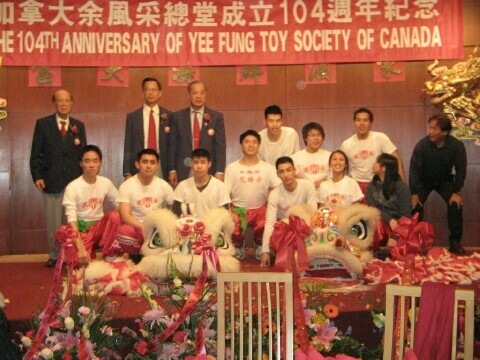 YFT Society of Canada Board - 2008 Group Picture with Consulate General Yang Qiang and Judge Bill Yee. 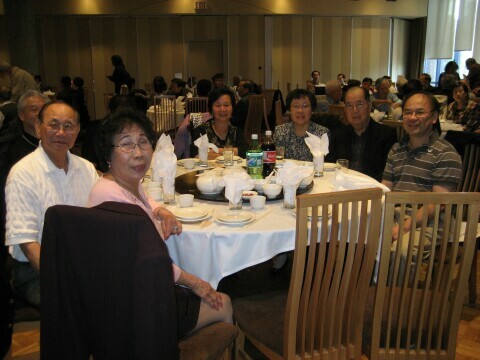 Our Spring Banquet started at 6 pm at the Floata Seafood Restaurant. 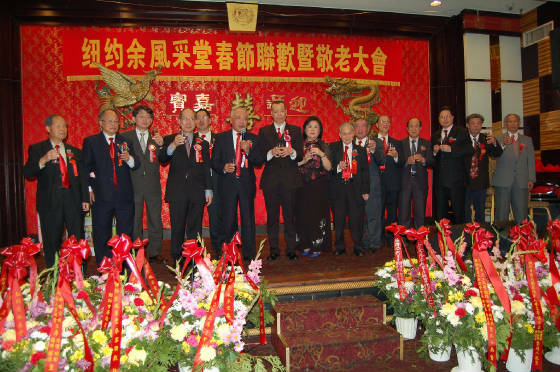 Honoured guests included the PRC Vancouver Consul General Yang Qiang; Vancouver City Councillor Mr. George Chow and Vancouver City Councillor Raymond Louie. 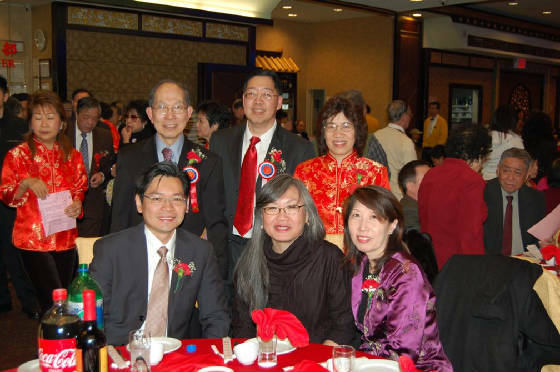 Also in attendance for the festivities were Seattle YFT Vice President Mr. Shum Yee and his wife, Advisor Mr. Fred Yee, Advisor Mr. Suey Yee and his wife plus two other Seattle guests. 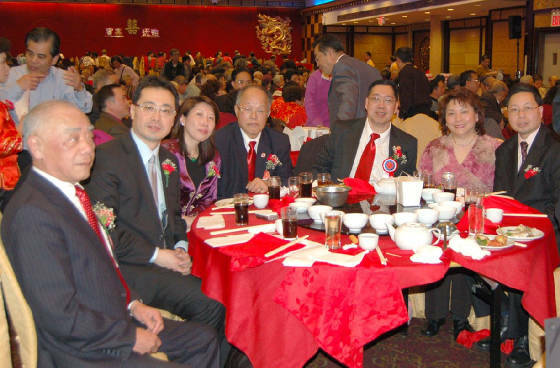 Special guests included Judge Bill Yee, YFT Society of Montreal Advisor Mr. and Mrs. Wing Shui Yee, his famous son, Doctor John Yee and his family. 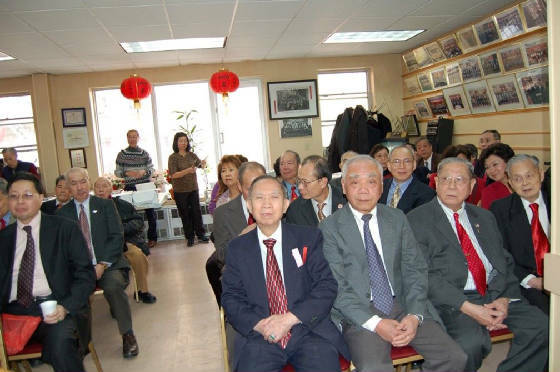 Other guests included the Mah and Tse Benevolent Association cousins, Fung Toy Alumni, and other invited guests from the Chinese Community, and of course, our own YFT members and their families. We had over 400 people attend this festive gathering. 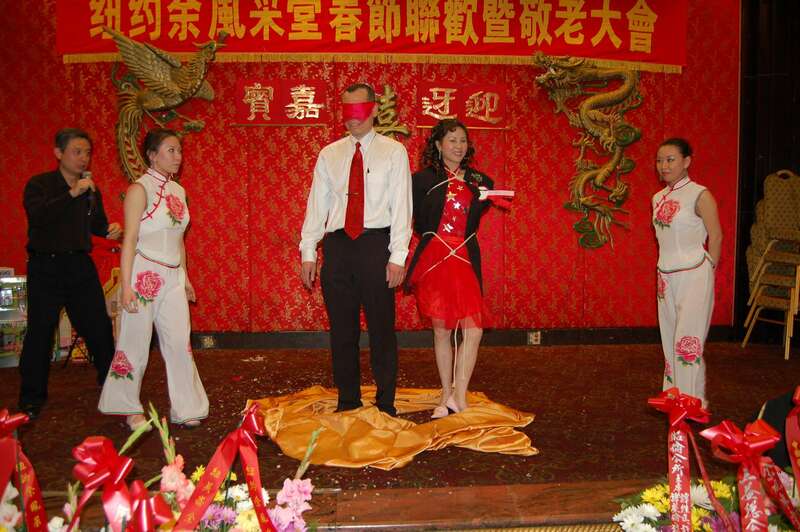 The Banquet festivities began with the traditional Lion dance performed by the YFT Youth Group, followed by the Yee Fung Toy Song sang by the Ladies Choir of the Recreation Committee. Ms. Esther Yue, and Mr. James Yu emceed the formal evening program. Both Esther and James did a fantastic job emceeing. As usual, Mr. Kan Yu delivered a wonderful welcoming speech. Anniversary Greetings from the PC Vancouver Consul General Yang Qiang, City Councillor Mr. George Chow and City Councillor Mr. Raymond Louie. After the speech by the YFT Society of Vancouver Chairman Mr. Jim Yee, who gave an account of the 2007 YFT events and the upcoming 2008 events. 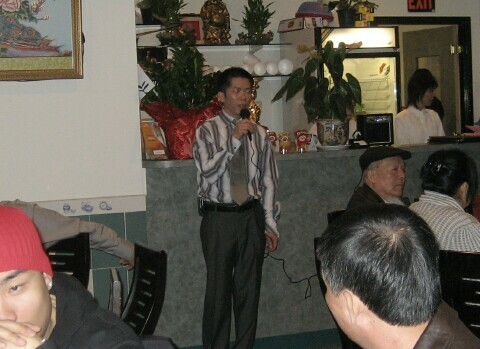 Mr. James Yu read out all the guest list and thank everyone who attended this anniverary event. 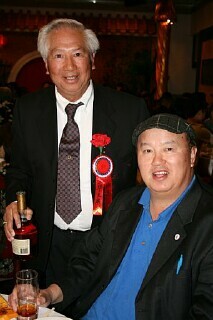 Both Mr. Phillip Yu and Mr. David Yee emceed the Vancouver YFT Scholarship Awards. There were 18 outstanding students this year. 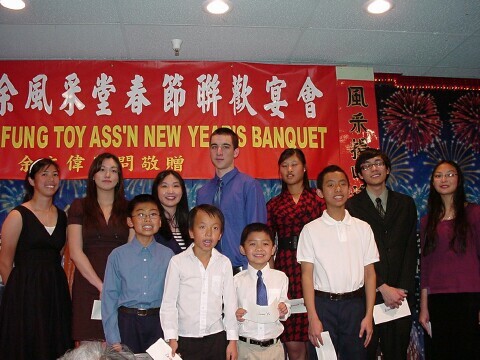 Five students were from the Elementary level: Natalie Yu, Ashley Yu, Christopher Yee, Allison Yu and Nicholas Yee. 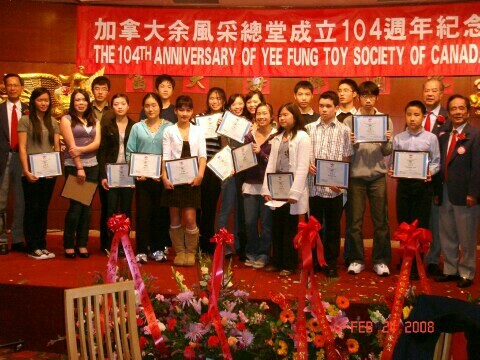 Twelve students were from the Secondary level: Maurice Yu, Nicole Yu, Anna Yee, Jackson Yu, Kayla Yu, Miranda Yu, Peter Yu, Elizabeth Yee, James Yu, Polly Yu, Tiffany Yu and Alvis Yu. One from University: Annabelle Yee. Mr. Phillip Yu and Esther Yue emceed the entertainment portion of the program. 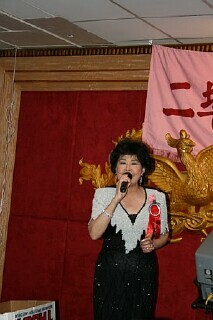 Performances by the Fung Toy Alumni and songs from the Women’s Singers were followed by a few guest Karaokes. 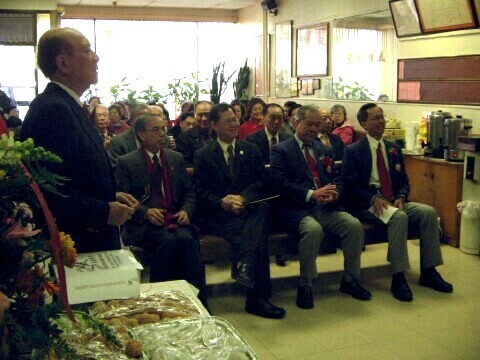 Judge Bill Yee, Seattle's YFT Family Association Advisor Fred Yee and several guests sang Karaoke for us. This anniversary cerebration was a tremendous success! Thanks to the volunteers and YFT board members who helped to organize this annual event. Hope to see you all next year. 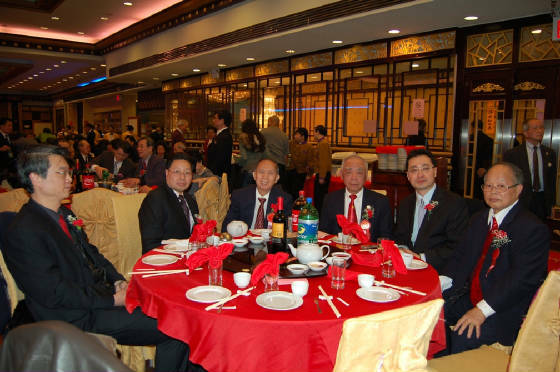 The 20th Yee Fung Toy Association Banquet was held on February 24th, it was a smashing success with PRC consulate officials and Taiwan Economic and Cultural office staff attending. A total of 220 people attended this yearly function and 17 Yee youngsters were awarded scholarships. 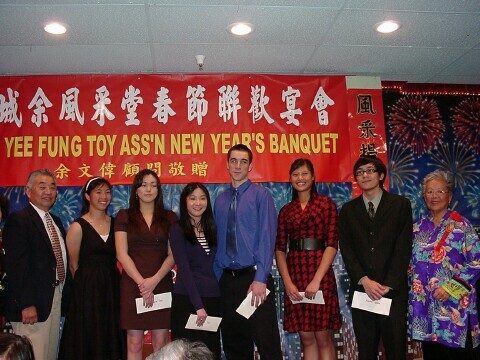 Last year, when Fang Li and Zhou Ding witnessed that none of our young scholarship recipient could utter a word of Chinese, they offered $200 seed money for our association to promote the Chinese language. A year later, all of them said something to express thanks and appreciation; Mathew Bruce and Michael Yu both gave their acceptance speeches, in Chinese of course. The scholarship recipients were: Michael Fan (范凱靜), Abigail Yee, Emma Yee, Michael D. Bruce (永基), Mathew J. Bruce (永杰), Elizabeth Yee (余美華), Kevin Yee (余健輝), Melody Yee (余誠娟), Dana Joe (周穎賢), Jeffrey Joe (周銘仰), Theresa Yee (余穎欣), Ying Tung Yu (余影彤), Lucinda Yu (余西好), Michael Yu (余建豪), Peter Yu (余建威), David Yee (余柏健) and Denise Chee (朱珍兒). In Sound of Music, the Von Trapp family sang Edelweiss; we have the Bruce family sing O My Darling Clementine (in Chinese again), with the audience joined in for the chorus. 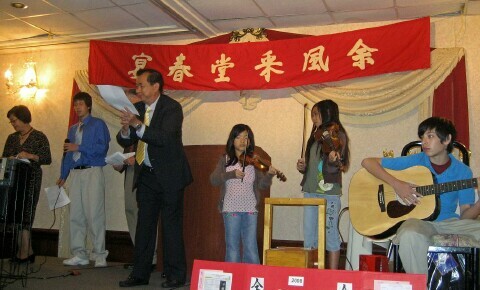 Mark Bruce played the guitar, Dona and Chi Chi Zhong played the violin in support. 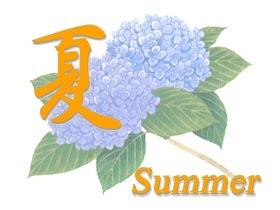 Sun neen fai lok「新年快樂！」, sun tai keen hong「身體健康！」to all as we welcome the Year of the Rat, 4706. 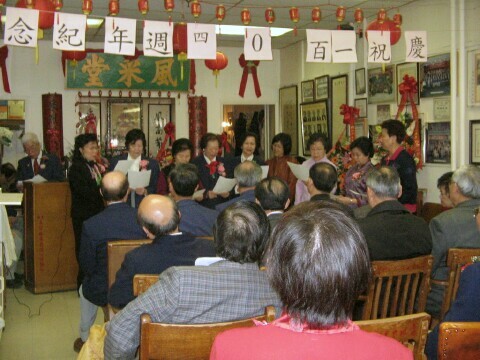 The New York Yee Fong Toy Association held its Chinese Lunar New Year and honoring senior members’ celebration on Saturday, March 1, 2008. 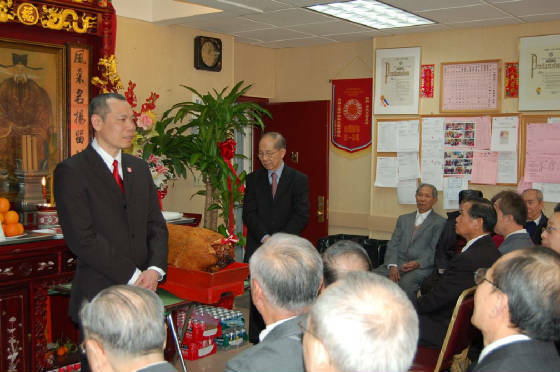 Shortly after noon, our newly elected President Gong Sum 鋼深 joined with our leadership, members, cousins from Boston chapter, Ma & Tse associations to participate in our traditional ancestor worship ceremony. After the usual formalities, President Gong Sum welcomed everyone and proclaimed the start of the day’s celebrations. 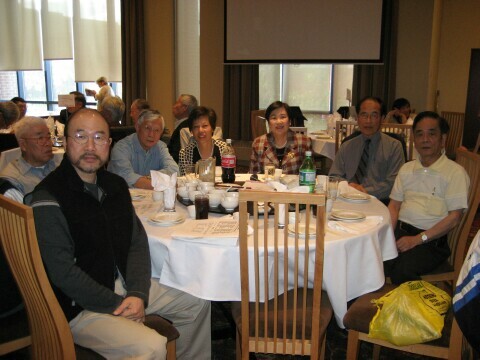 Deputy Inspector Gin Yee 余振源 also joined us as we all enjoyed the buffet luncheon. 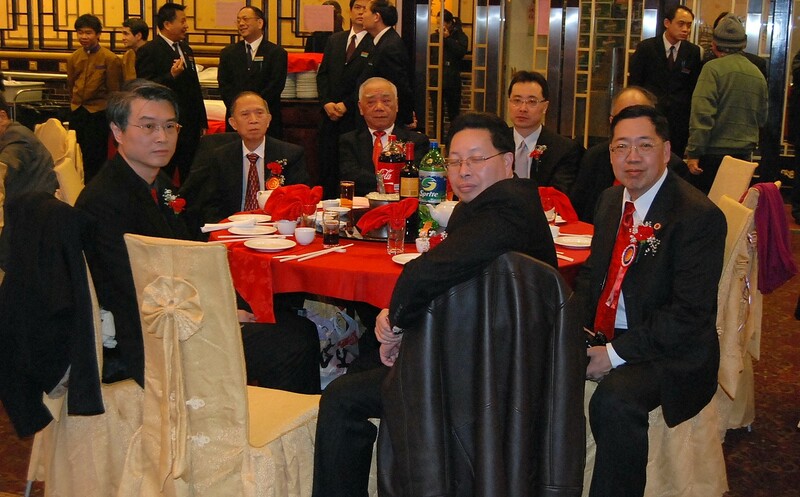 The evening Spring Banquet gala was again at Jing Fong Restaurant. A uniqueness throughout the evening was that life is full of choices and that one needs to take some risk to gain the rewards. As guests came, a group of the Women’s League staff greeted them all. However, this year the staff decided to dress in traditional red jackets. This refreshing look added such a festive atmosphere to the occasion. The restaurants quickly fill with nearly 1000 attendees. Photo op with vip guests: CCBA Pres. Justin Yu, TECO Director General Kenneth Liao, Deputy Inspector Gin Yee & others. 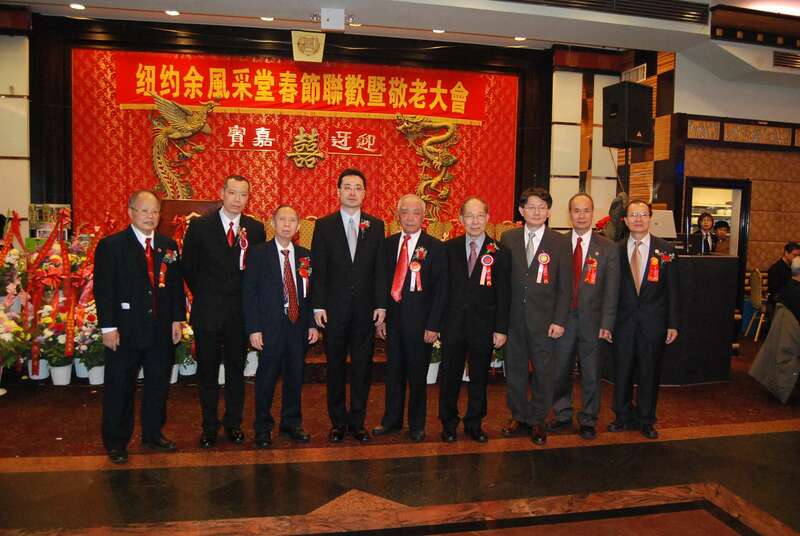 As expected, the Chinese Consolidated Benevolent Association group led by newly installed President Justin Yu 于金山, Lin Sing Association President James Wong 黃達良, Hoy Sun Ning Yung Association President Alex Wong 黃英漢, Kenneth K.M. Liao 廖港民 (the new Director General of Taipei Economic and Cultural Office (TECO) in New York) as well as many others arrived early. Following a brief stay and photo op, the group had to return to their installation celebration. Next, was an historical moment for our New York Yee family. 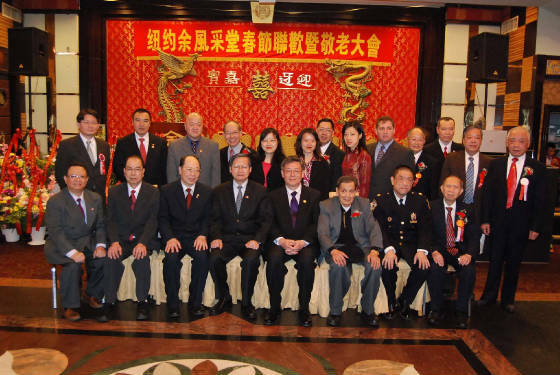 The Consul Zhu Liu 朱柳 of the People’s Republic of China in New York arrived to attend our celebrations. This was truly the dawn of a new era, all we had to do was ask. Also attending were Deputy Director General William W. Lin 林維揚 and Director James Wei 魏煥忠 of TECO in New York. 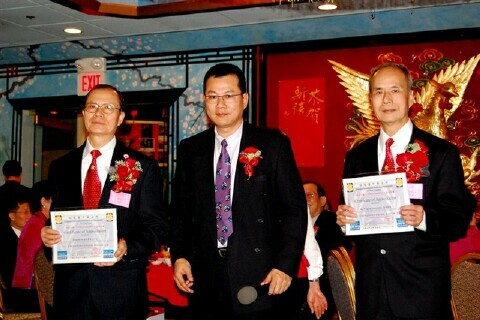 Consul Zhu of PRC in NY and Deputy Director Lin of TECO of NY. 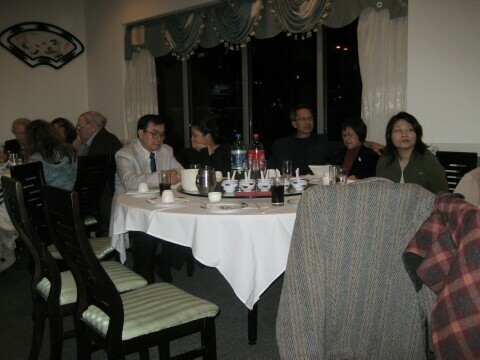 Then, our Grand Elder Peter 耿石 was placed in a unique situation when Deputy Director Lin asked if he can sit with Consul Zhu of PRC. 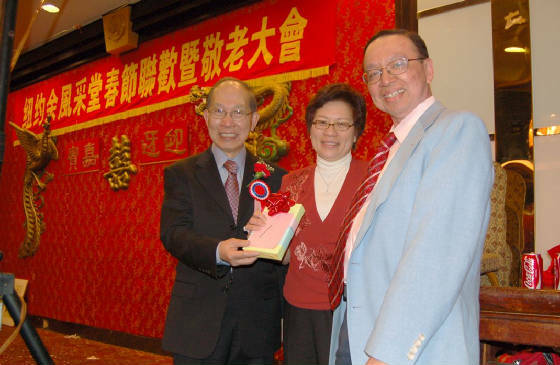 To Grand Elder Peter’s exuberance, Consul Zhu agreed when asked. Peter, then taking a risk, said to Consul Zhu that he had a dream that the two representatives would shake hands, after all we are all Chinese. Again to Peter’s amazement, Consul Zhu agreed. We were all in awe that one historical moment led to another. Welcoming and introducing everyone was Women’s League President Kennie 錦娉 who also acted as Master of Ceremony for the night. 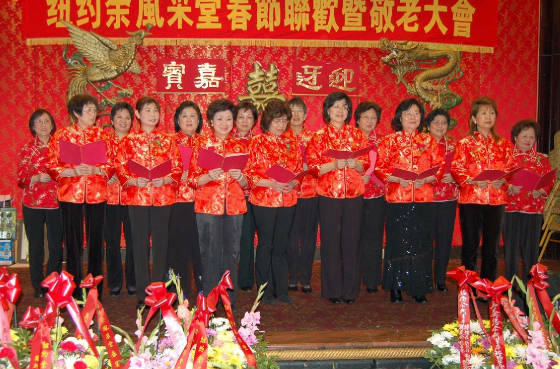 Shortly after President Gong Sum’s opening remarks, a few of the Boston’s Women’s League joined our Women’s League group for a singing debut of traditional Chinese New Year songs. 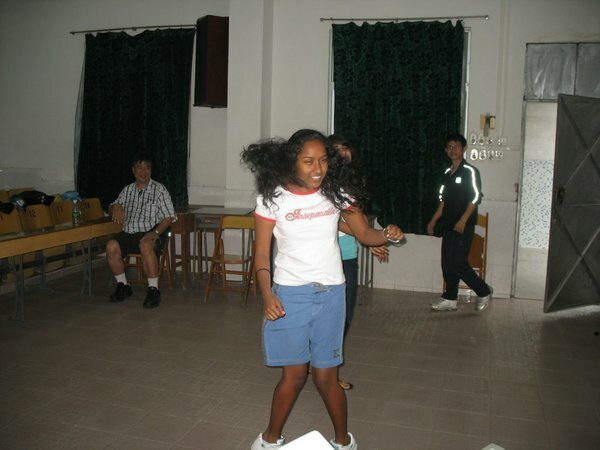 Everyone was enchanted by the performance that included some dancing routines. 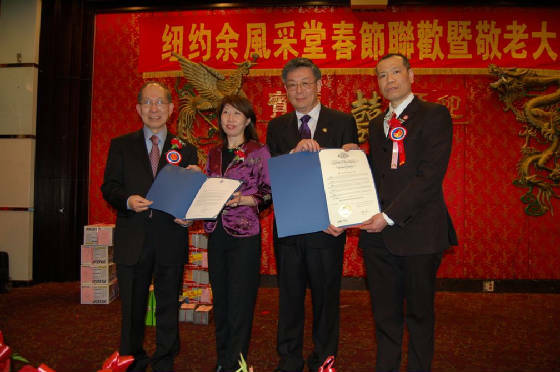 Before continuing, I would like to acknowledge the following people: New York State Governor Spitzer for sending representatives Lai Sun Yee and George Hu to present us with a Proclamation as we celebrate the Lunar New Year, the Year of the Rat; Manhattan Borough President Scott Stringer for sending Jimmy Yan to present us also a Proclamation; New York City Comptroller William C. Thompson Jr. for sending Sandra Ung to present us with a Commendation; and finally, Councilman John Liu for taking time out of his busy schedule to bring a Proclamation and say a few congratulatory well wishes for the New Year. John has been an advocate for Asian affairs and we need to support him so we can have a voice in government. The free raffle was such a hit last year, we had to do it again. 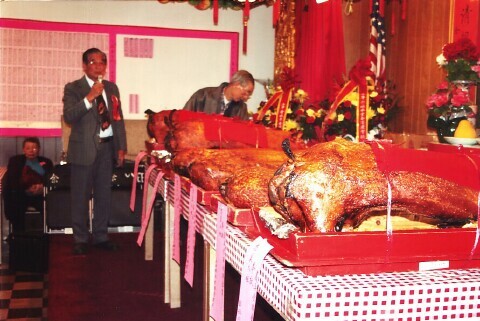 We want to thank Kathy Design, Ltd., Jing Fong Restaurant, Mr. & Mrs. Frank Yee, Mega/Merica School and White Swan Bakery for donating to the 21 gifts that were raffled off. 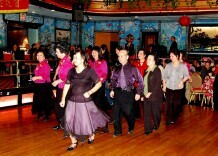 The evening was also filled with entertainment from the DJ 李國帡 and his performers. They even got President Gong Sum to participate in one of their routines. A picture is worth a thousand words, but being there is much better. For those who did not come, there is always next year. But the choice is yours, you need to act early. 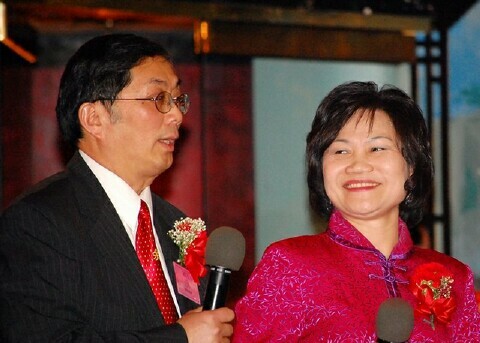 As a reminder, the 2009 National Yee Family convention will be in New York City and fast approaching. It will be quite a busy time with the need of resources and help. Make the choice to volunteer; the rewards could be enlightening. This evening does not just happen. Many hours and efforts goes into making this work. So, once again thank you all for making this year another joyous event and hope to see everyone next year. 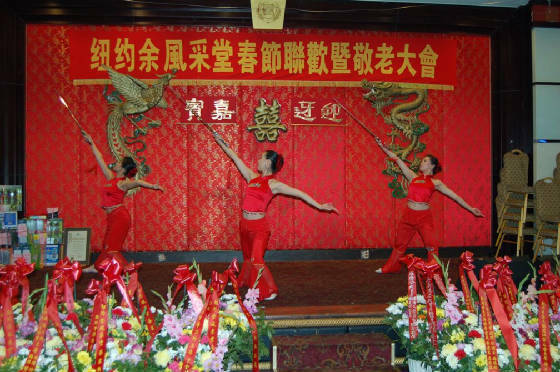 Sounds of "Gung Hay Fat Choy" filled the room at the Phoenix Yee Fung Toy Family Association Spring Banquet held at the Great Wall Hong Kong Cuisine Restaurant on Saturday night, March 1st. 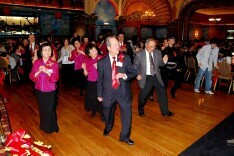 Over 390 Yee Family members and friends enjoyed an evening together to celebrate the Chinese New Year of the Rat. 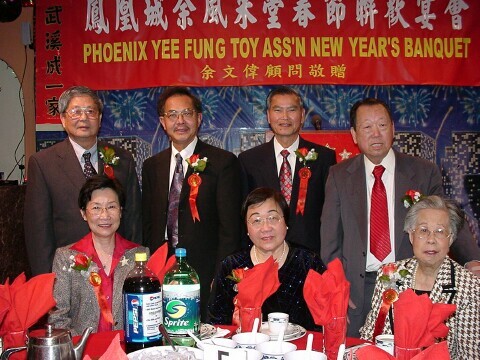 Los Angeles YFT Association President Stanley Yee and his wife Amy, Western U.S.Grand Vice President Alan Yee from Los Angeles, Western U.S. Grand President Joseph Yu and his wife from San Francisco and Grand Elder John M. Yee and his wife from Phoenix. 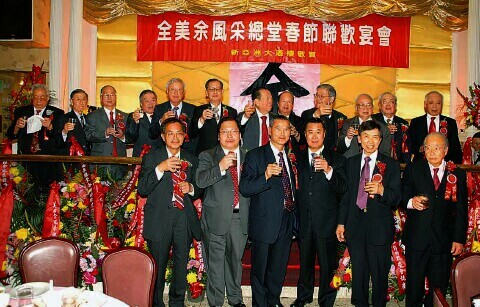 Honored guests included Western U.S. Grand President Joseph Yu from San Francisco and Western U.S.Grand Vice President Alan Yee from Los Angeles. 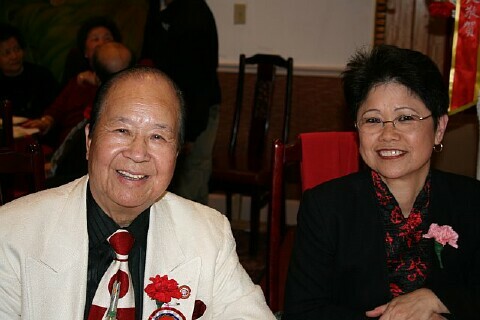 Los Angeles Yee Fung Toy Association President Stanley Yee and his wife Amy were present for the evening festivities. A special highlight of the evening was the recognition of Mrs. Sue Hing, who is the eldest Yee Family member in attendance. 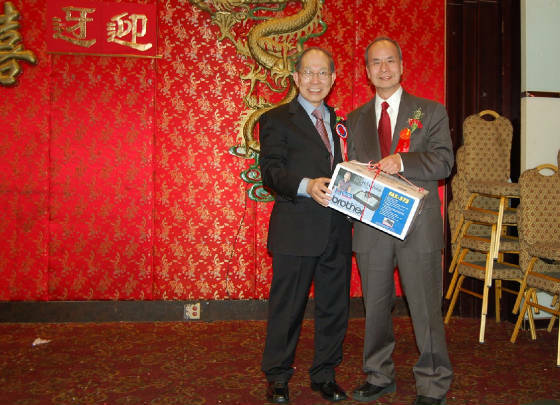 President Rudy Yee presented a red envelope with lucky money to her for this honor. 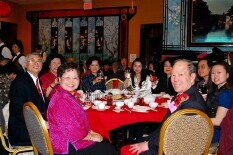 President Rudy Yee and Mrs. Rudy Yee (Mary Ann) with scholarship students. Outstanding Yee students were presented scholarships for their scholastic achievements. High school students include Kaysey Fung of Xavier College Preparatory, Elizabeth Yee of Washington High School, Megan Yee of Desert Mountain High School, Tyler Tompkins of Saguaro High School, Stephanie Yee of Hamilton High School, and Michael Wong of Horizon High School. 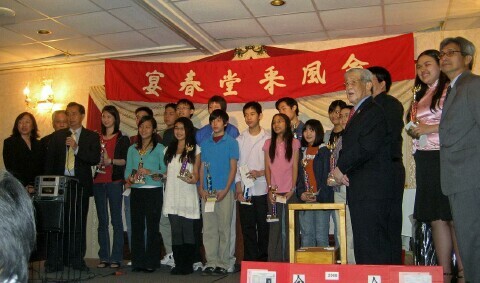 Junior high scholarship winners included Zachary Yee and Emily Yee. Chinese school winners were George Yu, John Yu, and Derek Yu. All outstanding students expressed their appreciation for the Yee scholarships and the support of their proud parents. 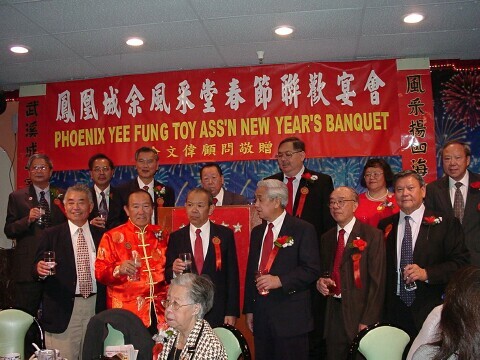 The Phoenix Yee Fung Toy Association expressed its grateful appreciation for everyone and their participation in this joyful event. Thanks to the generosity of the Great Wall Hong Kong Cuisine Restaurant, New Hong Kong Restaurant and the Super L Market for providing the gift certificates for the raffle drawing. Everyone enjoyed another New Year dinner with family and friends and is looking forward to next year's Yee Spring Banquet. 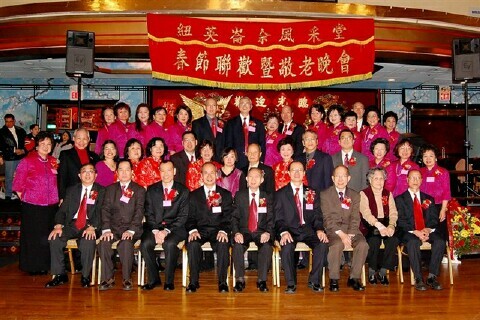 The Spring Festival and Seniors Appreciation Banquet was held at the Empire Garden Restaurant on Saturday, March 8, 2008. 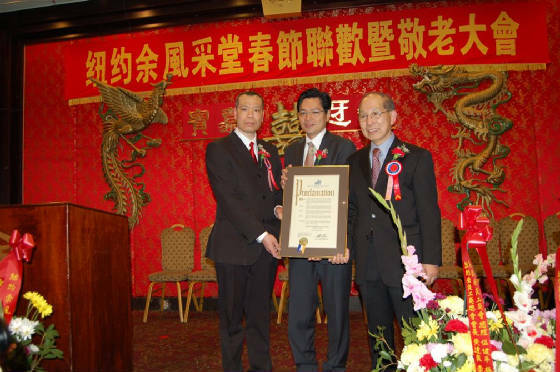 Gilbert Ho, President of the Chinese Consolidated Benevolent Association of New England, presents CBA Award Certifcates to President Ho Lee (right) and Vice President Jack (left). 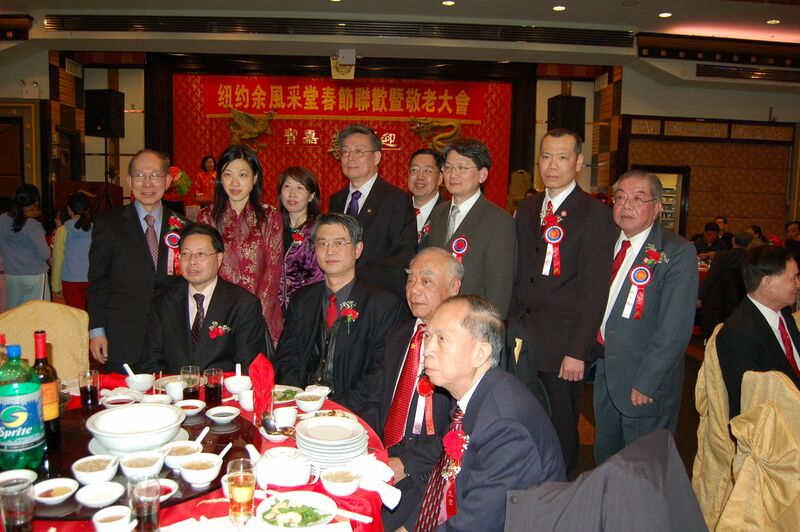 Photos courtesy of Ken Lee, brother of Sarah, Chairperson of NE YFT Women's Committee. The Detroit Chapter held its Spring Banquet at the Golden Harvest Restaurant in Warren, Michigan on Sunday, March 16th. 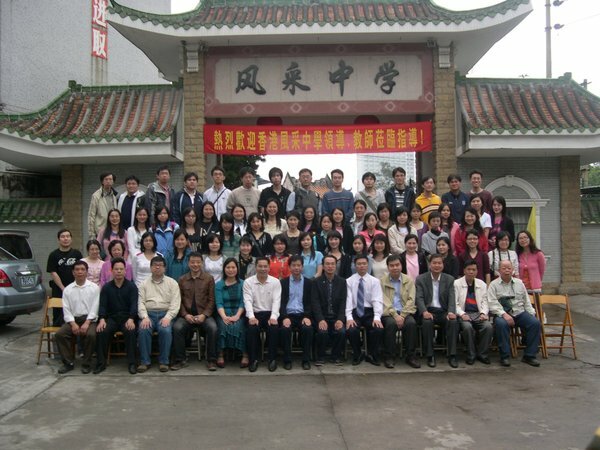 Group picture of students and teachers. 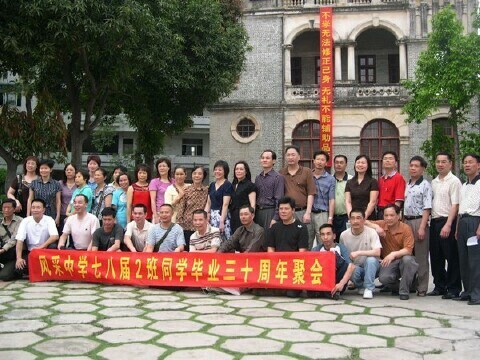 Fifty Elegantia College Students and teachers visited the Kaiping Fengcai Middle School on March 17, 2008. 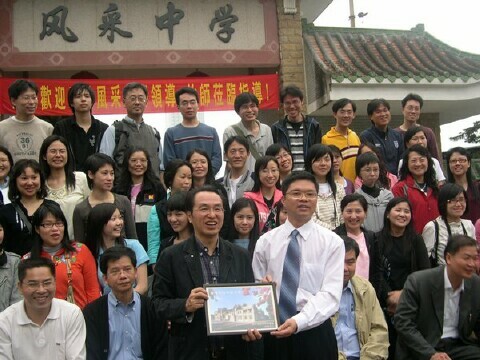 Through this one day face-to-face exchange of educational ideas and informations, the relationship and friendship between the two schools were bolstered and deepened. 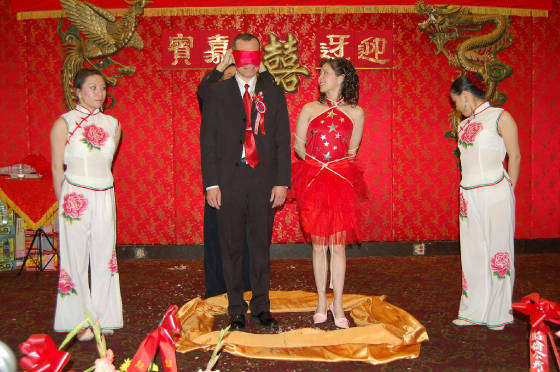 We welcomed the Year of the Rat and celebrated the Spring Festival on Sunday, March 30, 2008. 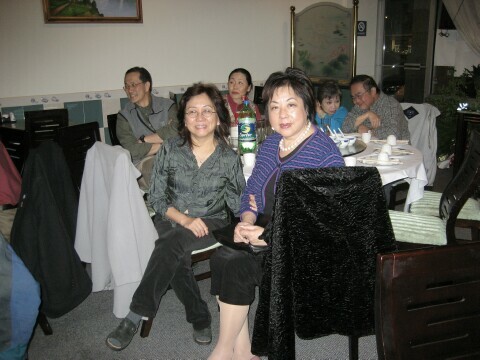 We all enjoyed a Dim Sum Lunch at our YFT Office after paying homage to our ancestors at noon. 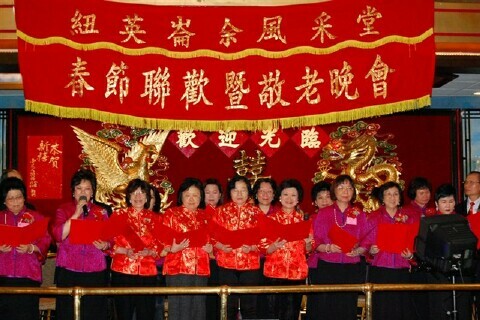 Our senior citizen members who are 75 and over received lucky red envelopes and had their pictures taken. 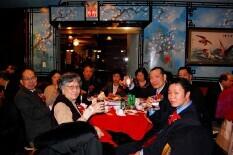 In the evening, the 2008 Spring Banquet dinner was held at the Rice Bowl Restaurant. Close to 450 guests attended our Spring Banquet this year. Guests from the San Fransciso YFT Headquarter, guests from the Stockton YFT Chapter, our Mah cousins and honored guests from the Sacramento community. 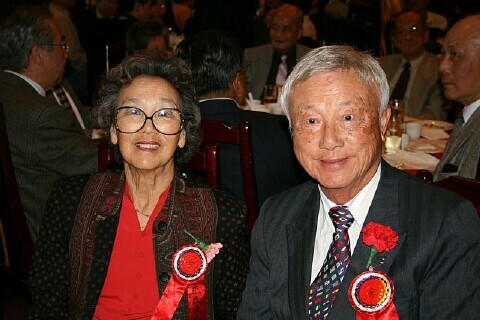 Dr. and Mrs. Herbert Yee at the Banquet Head Table. 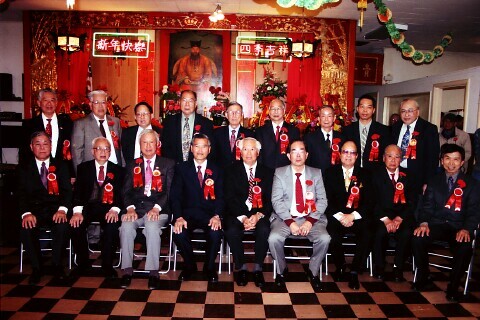 Sacramento YFT Grand Advisor Gene Yee. Vivian Yee belts out another popular Chinese song (left) while President Stanley Yee offers a bit of Spring Festival "Cheer" to a former Sacramento YFT Board member (English Secretary), Dr. Robert Yee (Dr. David Yee's Dad). 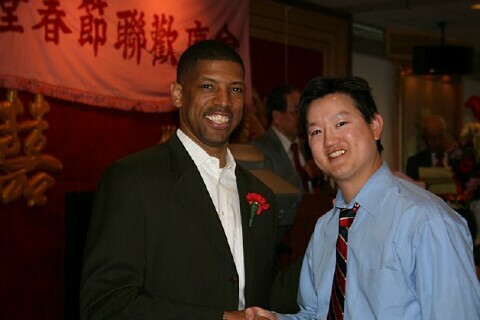 Dr. David Yee with Three-time NBA All-Star Kevin Maurice Johnson. 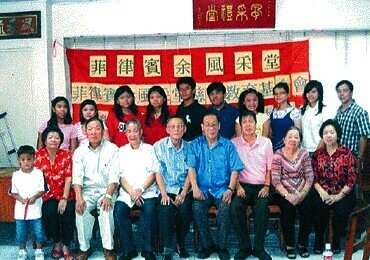 Photos courtesy of Dr. David Yee, grandson of Dr. Herbert Yee. 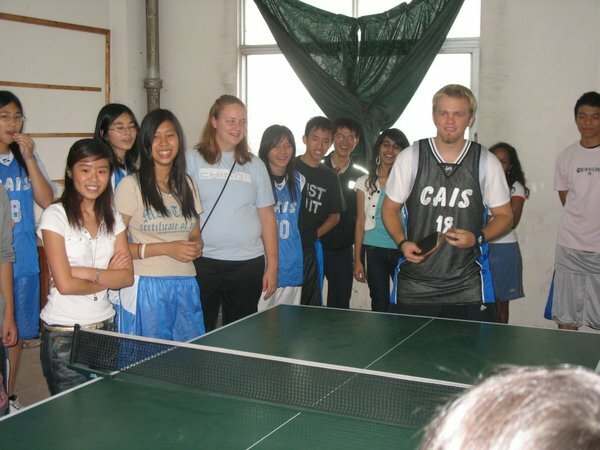 On April 19, 40 students and teachers from the Hong Kong Christian Alliance P.C. 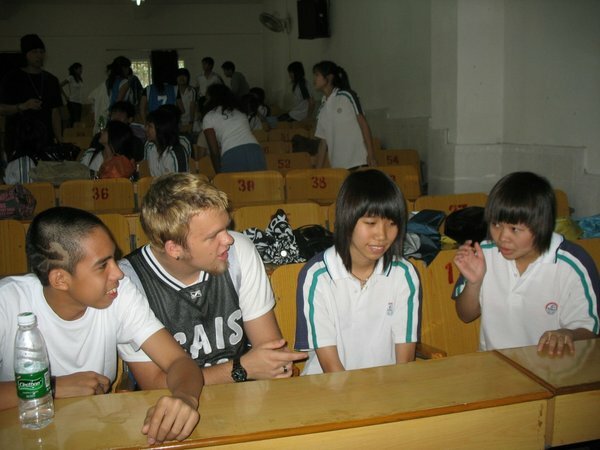 Lau Memorial International School visited the Kaiping Fengcai Middle School. During their visit they carried on a cultural exchange activities with the Kaiping Fengcai Middle School Class 4 and 5 students. The entire exchange process between the school students were carried out in English. These students were having a great time as they were attempting to express their own viewpoints in English. The P.C. Lau Memorial International School students performed a modern day drama and a dance routine for the Fengcai audience, and they also joined in a friendly ping pong competition. Through this exchange, the students have reflected of this rare and unique opportunity, that they have learned many things, they also decided and determined to learn more English and to enhance their own competitive ability. 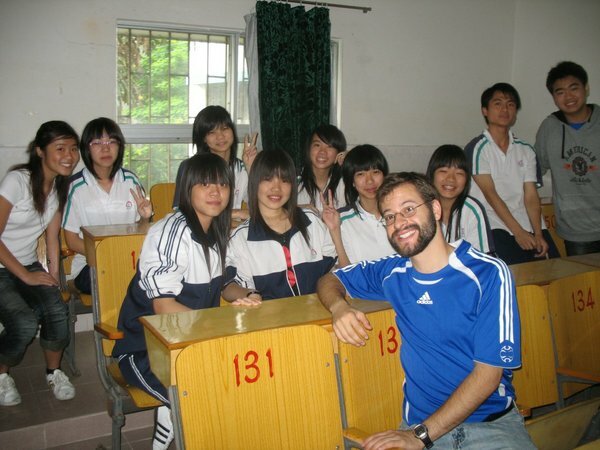 The Fengcai Middle School students hoped that the school will provide more similar exchange opportunities in the future. 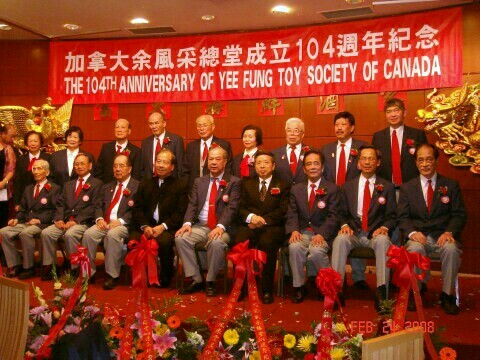 The Phoenix Yee Fung Toy recently celebrated their 19th Anniversary of acquiring the Yee Fung Toy Building. Over 100 family and friends filled the meeting Hall on Sunday, April 27th for all the food, fun, and festivities. 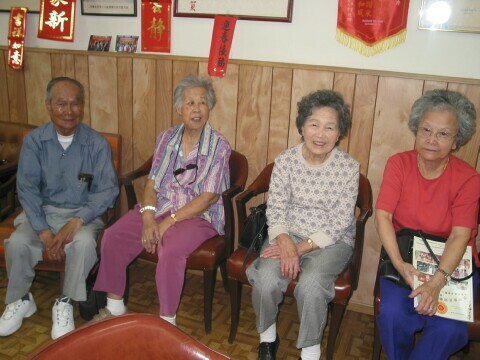 A large scrumptious buffet lunch of Chinese dishes was served and enjoyed by everyone. 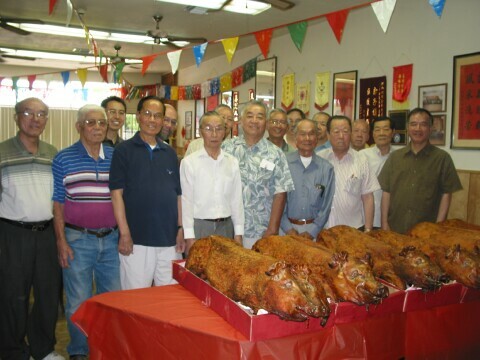 Six (6) roast pigs were donated for this special event and all Yee Family members were given a portion to take home. Grand Elder, John M. Yee expressed his delight in seeing everyone enjoy the celebration and all the delicious food and home make pastries. 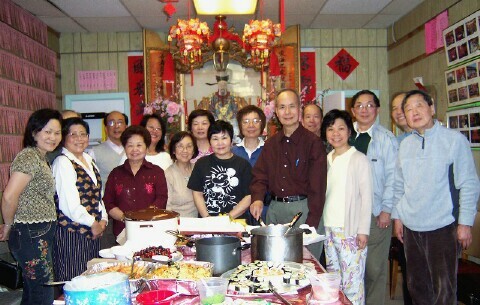 He said, "We need to have more celebrations to enjoy the fun and fellowship of the Yee Family and friends". 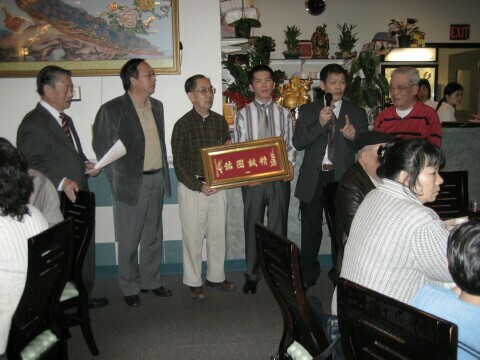 Twelve members of the Seattle Chapter of the Yee Fung Toy Association were among those attended a Chinatown dinner at Ocean City Restaurant for the relief of earthquake victims in China. The earthquake that struck Sichuan province on May 12, along with the many aftershocks, killed over 70,000 people, and 19,000 are still missing. 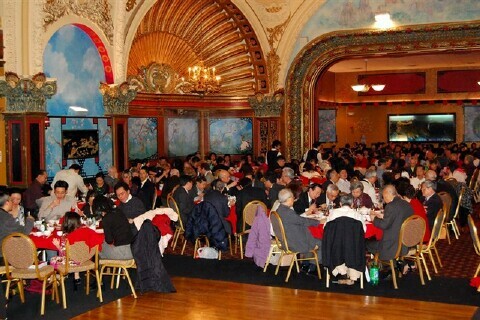 The Northwest Asian Weekly reported that the June 1 event which was organized by Chinatown community organizations raised $166,596 for earthquake victims in China — a record-breaking amount accomplished with just two weeks' preparation, thus exceeding the original goal of $100,000. The strategies these organizations used to raise that much money can be employed by other groups who are planning similar charitable events. Most of the money was raised during a live auction and dinner, held for 540 people at Ocean City Restaurant. 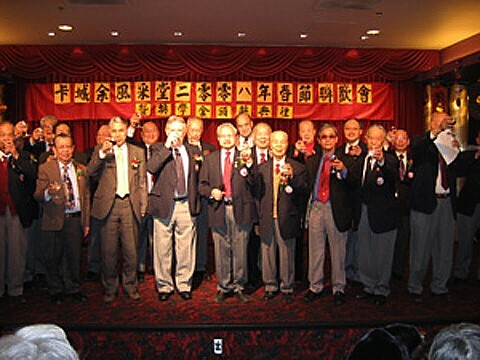 Wing Yee (second from the right), accepts memento from the CBA of Vancouver on behalf of the YFT Society of Vancouver. 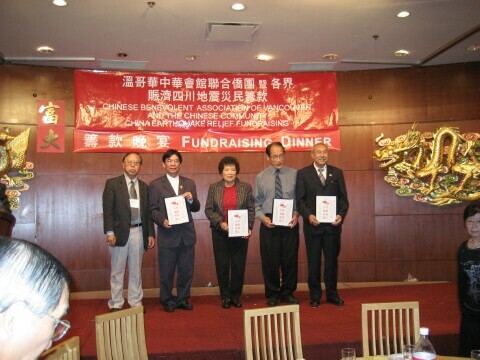 The Chinese Benevolent Association of Vancouver and the Chinese Community hosted the China Earthquake Relief Fundraising Dinner on Friday, June 13th, 2008 at the Floata Seafood Restaurant. Aside from individual donations, 20 members of the YFT Society of Vancouver supported this worthy cause, each bought a dinner ticket with portion of the ticket ($20) going directly to the China Earthquake Relief Fund, care of the Red Cross Society of Canada. Emcees for the Fundraising event were Mr. Jun Ing and Ms. Fanny Zhou. We all stood for three minutes of "moment of silence" before the fundraising program starts, paying tribute to the recent May 12 victims of the disaster area that have been severely affected by 7.8 magnitude earthquake. This quake is considered to be a major catastrophic event. The Canadian Government, along with the Provincial Governments, and many generous, concerned people from all across Canada, responded and donated huge sum of money and supports to help the people in Szechuan to rebuild their homes or shelters. In addition, providing food aid and technical assistance. The quake victims of the Szechuan Province will soon find comfort and safety with the help from the donors of Canada, and donors from all over the world. 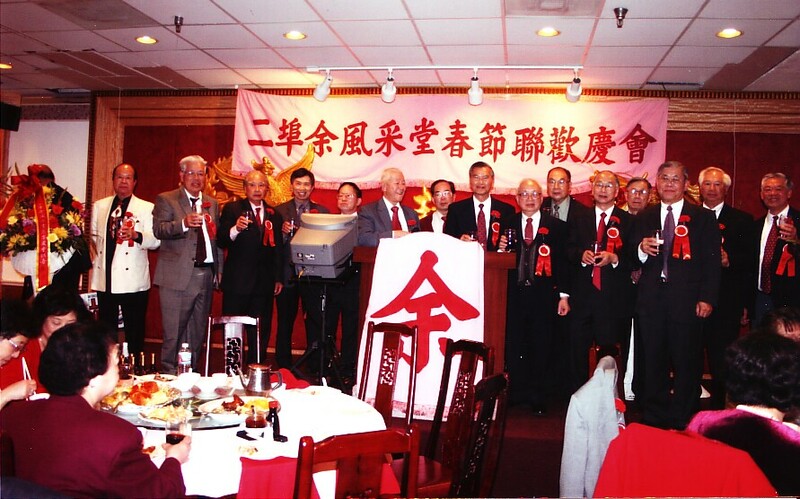 The Fundraising program included introduction of guests, speeches from the Chairman of the fundraising Committee, Mr. Mike Jang, the Consul of the PRC, Mr. Chen RiBiao, and representives from the three levels of Government. Auctions, Karaoke fundraising variety show, memento presentations and raffle draws filled up the evening program. The CBA of Vancouver President, Mr. Mike Jang was so proud to announce that they have raised over $1 million dollars to date, doubling the amount of money they had targeted for. 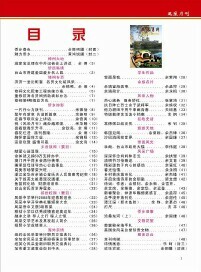 The next issue of the Yee Fung Toy Global Village Voice will be published in mid September of 2008, featuring summer picnics and other activities at Yee Fung Toy associations around the world. Please submit your articles to the Editor via email (editor @ yeefungtoy.org) or postal mail (The Editor, 226 East Georgia Street, Vancouver, B.C., Canada V6A 1Z7) by August 15, 2008.